Your company name will really get around with our N-Dome™ Imprinting Process on our ultra-stylish Orbit Coasters. 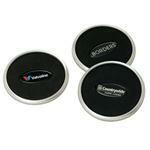 These durable coasters feature a rubber outer ring to prevent sliding. Comes in Blue or Smoke. A great complement to any boardroom or office, our elegant Reflections Coasters offer an attraction value that is unmatched. Each coaster features our unique N-Dome™ Imprinting Process. 3 3/4” Dia. Full color coaster. Production Times Available: Five working days from artwork approval for catalog quantities. Typical Imprint Area(s): 1 3/8 inches. 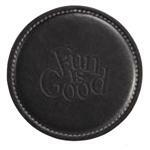 Reflections Coaster - full color dome imprint.